Nitrox mixes contain more than 21% Oxygen are known as; enriched air, enriched air Nitrox (EAN or EANx). SeaComAir LP Nitrox System uses a Semi-Permeable Membrane to produce oxygen-rich air (Nitrox). The Permeable Membrane System produces any blend of Nitrox from 21% through 36% Oxygen (O2) by de-nitrogenating (removing nitrogen). Portion of the nitrogen in air is separated out, producing a Nitrox mixture 21% to 36% Oxygen. The input pressure to the Membrane System determines the % O2 produced. The Nitrox is then delivered to a High Pressure (HP) Compressor to fill Scuba Cylinders or Storage Tanks. Nitrox is used within the Recreational, Technical and Commercial Diving. Low Pressure Nitrox Generator connect to High Pressure Compressor Packages will supply 32% , 34% or 36% Nitrox. 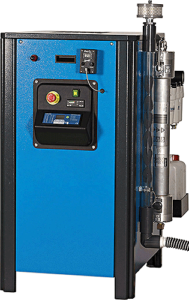 This systems are most cost effective Nitrox production from 300 L/min - 10 cfm up to 500 L/min - 17,5 cfm.